Stacey Middle School offers many unique electives such as leadership, robotics, videography, and broadcast journalism. This year, the journalism students were thrilled to hear that they would be visiting Fox 11 News. The idea of a field trip was initiated by eighth-grade journalism student, Madelyn Fracassa. Carol Fracassa, Madelyn’s aunt, is the one to thank. She helped arrange the tour since she produces the morning news at Fox 11 in Los Angeles. Students arrived at Fox 11 News early Thursday, Nov. 30 around 9 am. They were first led to see the writer’s area, where most of the writing and editing are done. Soumada, a meteorologist welcomed the future journalist and encouraged the future journalists to study hard and never give up. Talking to Bob DeCastro, the morning anchor, while he was on a break, he encouraged students to learn to write well and begin by studying how their favorite journalists perform in order to eventually find their own style. The class got a chance to check out the news van that holds all of the equipment in case of breaking news. Several students were able to hold the camera on their shoulder to see just how heavy it was. Following that, students visited the control room where they saw the directors and producers make the news. The last, and most ground defying spot they visited, was the live morning segment, where the students got a chance to be on national television. “I came in knowing that I would get on TV, I know that my peers doubted me or thought I was joking, but little did they know, I was on TV!” states Caitlyn Timmons eighth grader. Students simply waved goodbye to the “audience” helped the anchors, Marla Tellez and Bob DeCastro and meteorologist Araksya Karapetyan close the segment. The class was overly grateful and inspired by the experience. Some even are inspired to become a professional news anchor or journalists. 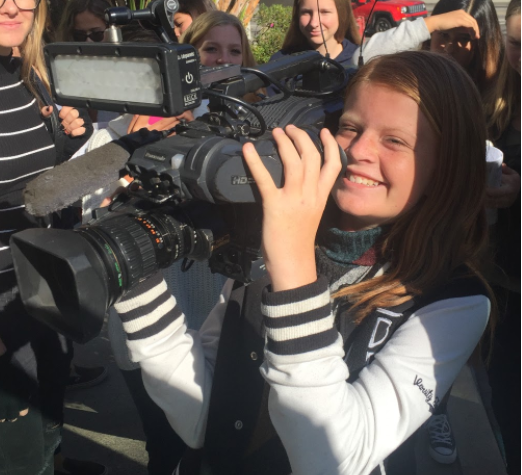 “After that field trip, and hearing what the anchors had to say, I think that I may want to become a reporter or journalist in the future,” says seventh-grader Avalyn Walton. I know, Caitlyn + Averi put it on Instagram + Kelsey told me.